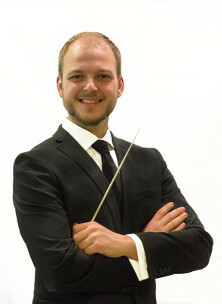 Andrew Burger is a conductor and performer from Niskayuna, New York. He recently completed his master’s degree in choral conducting from Bard College and is currently the director of music ministries at the Niskayuna Reformed Church. During his time at the Niskayuna Reformed Church, where he is in his fifth year as director, he has conducted numerous anthems and larger works including Faure’s Requiem, Maunder’s Olivet to Calvary, and Vivaldi’s Gloria. He recently conducted the department’s first concert as part of the New York Sacred Sites events, featuring works historically relevant to the church’s 250-year history. While at Bard College he served as assistant conductor and administrator, conducting the Bard Chamber Singers, Bard Symphonic Chorus, and The Orchestra Now. He had the pleasure of conducting works such as Bruckner’s Te Deum and Handel’s Zadok the Priest and also served as rehearsal conductor for the department-wide performance of Handel’s Messiah. He studied conducting with James Bagwell. During his time at The College of Saint Rose, where he received his bachelor’s degree in music education, he won the Concerto Competition playing Gregson’s Tuba Concerto. An active vocalist and instrumentalist, he sings throughout the capital region and maintains an active lesson studio. While not pursuing his musical career, Andrew helps on his parent’s greenhouse and vegetable farm in Niskayuna, where he is foreman and retail manager. He would like to thank everyone at Chorus America for the opportunity to participate in the Conducting Academy.